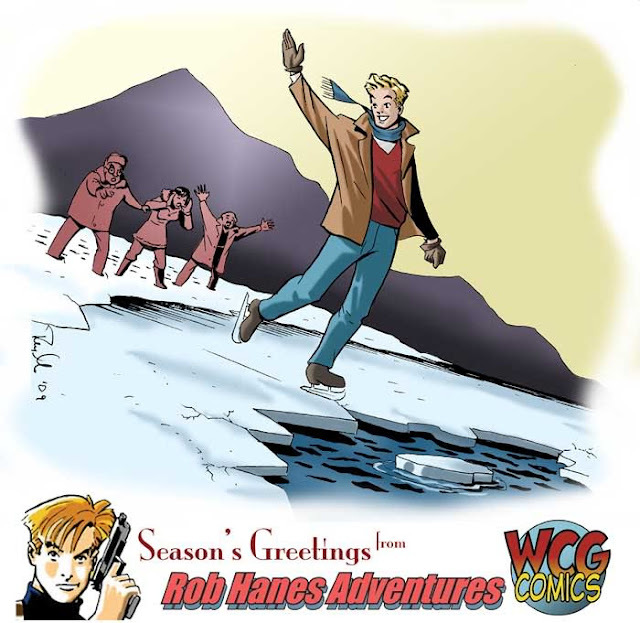 Happy Holidays from WCG Comics! Past holiday greeting cards may be viewed here. It was another great year for WCG Comics and Rob Hanes Adventures—my thanks to everyone who supported the series. Issue 12 was released this year (debuting at the San Diego Comic-Con), as well as three never-before-seen stories online dating back to the 1980s at my rhadventures.com webcomics site. I also joined Facebook this past year. 2010 promises to be another exciting year. I will be making an official announcement shortly about the upcoming release of the first volume collecting the series in trade paperback format. Also schedules is the release of a special color edition issue! Thanks to a friend who works as an entertainment blogger, earlier this week I finally got a chance to see Inglourious Basterds at a closed screening in L.A. to celebrate the film's release on DVD the following day. The viewing was attended by none other than the director himself, Quentin Tarantino, as well as some of the film's stars including Diane Kruger, B.J. Novak, Eli Roth, Samm Levine, and Omar Doom, as well as Tarantino's longtime producer, Lawrence Bender. Here's my report from behind the press line at the red carpet event, as well as a quick review of the film. To go straight to all my photos from the event, click here. Although the press had been directed by the organizers of the event to park at a separate location away from the theater (presumably to prevent traffic, crowd and parking problems near the revival house venue which is located in a more residential and sedate part of town away from the somewhat more bustling parts of nearby Hollywood and West Hollywood), since it was a theater I'd been to many times, I easily found parking nearby on a quiet, dark residential street only a couple blocks away. As I walked to the theater, I saw that it had been dressed up like a classic movie premiere event, complete with large arclights pointing to the sky and a classic red carpet at the entryway. I wasn't able to get past the security people and the front of the theater until my buddy came out from the secure area with the press wristband he had snagged for me; it was cool to be able to bypass the regular line of special ticket holders and hang out in the press area that was traditionally roped off from the red carpet area. We were near one end of the press line, closest to the front of the theater—in fact, we were facing the main doors. As my friend noted, there definitely is a pecking order in these things, and we were pretty much at the end of the line, but as far as I was concerned, at least we were in front of the theater, and not facing some unglamorous storefront. Living in L.A., I have a little familiarity with these kinds of events, and this one was pretty laid back and relaxed, no doubt in large part because there weren't any major A-listers involved, let alone major media that I was aware of, nor was it a major studio event. This simply seemed to be a party Tarantino was throwing for friends and fans. As a result, all the P.R. people were pretty nice, and the media people we were positioned next to were pretty friendly and talky as well. The actors were all friendly and engaged. All were charming and responsive; the funniest line I recalled was Novak. Referring to his character in the television show in "The Office," he joked that the film definitely was a step up for him, from "a douchebag to a basterd." Shortly before the scheduled screening time, the VIPs started showing up. For the most part, they made their way down the press line to be interviewed. As I said, it wasn't a major frenzy since it was a smaller, low key event and for the most part my buddy got to interview many of the people who came down the line, including Bender, Novak, Levine, Doom, and Roth. Those he didn't get, including Tarantino and Kruger (who was accompanied by Joshua Jackson, who she apparently is currently dating), stopped to talk with the video crew next to us, so even they were in close proximity to us as they walked by. As you'll see in my photos, before all going in, they stopped to take group shots. Inside, all the attendees were treated to free popcorn and bottled water placed at each of the seats—which I much appreciated since I didn't get a chance to grab dinner before getting to the theater after work! Tarantino was brought up to introduce the film. He had the cast members in attendance to join him on stage and, true to geek form, he announced that he had put together his own reel of previews. They were clearly intended to whet our appetite, as they consisted of mostly war mission films like the Dirty Dozen, Hornet's Nest, Army of Five, and, of course, the original Inglorious Bastards! As with most Tarantino films, Inglourious Basterds is brash and fun, proudly wearing its geek and genre cred on its sleeve. Like many of his other films, Basterds is a genre film that turns the genre on its head. It's also as much a black comedy as it is an action war film—after all, without giving anything away, given the film's ending, there's no way one can take the picture wholly seriously. But along the way, he manages to present his trademark crackling dialogue and create memorable and funny characters, while nevertheless giving viewers a chance to emotionally invest in some of the characters. The actors are all terrific, and it's important to recognize that their outstanding work was made possible by a solid script. While Christoph Waltz has deservedly received the lion's share of the attention for his turn as SS officer Hans Landa, Brad Pitt also deserves credit for having great fun with his character while also managing to keep it on this side of real. Pitt is a hoot to watch, even when he's not the main focus of a scene or a shot. Other great performances are delivered by Daniel Bruhl as Fredrick Zoller (who my friend described as the "German Audie Murphy"), Kruger as a German actress who also is a double agent for the allies, and Melanie Laurent as Jewish refugee Shoshanna Dreyfus hiding in plain view of the Nazis as a Paris theater owner. As always, Tarantino's women are amazingly strong and, despite the laughs, the film has its share of heart and tragedy. As he often does, Tarantino echoes movie moments throughout the film (much of its tone reminded me of Ernst Lubitch's To Be or Not To Be). 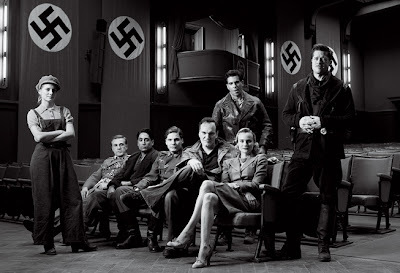 Though my wife loved the film, she did say she wished she had learned more about the Basterds and that the movie had focused on their background and how they got together, which is a standard formula for such movies. My response was that since this was a genre "men on a mission" film, there was no need for Tarantino to hew to this formula—anyone who grew up watching these films (as I did) like the Dirty Dozen and the Devil's Brigade already knows these characters, and the gauntlet of training and infighting they no doubt had to go through before coming together a team. This conceit allows Tarantino to go straight into the guts of the story. As mentioned in earlier blogs, "Koman! "—now being serialized at the rhadventures.com website—is the last of three stories originally produced in the 1980s but never released. These initial stories were produced on "spec" with no real plan at the time for how they were going to be released. Since they were my first attempts at doing work intended for print, they also functioned as learning exercises. When I began publishing the series, I naturally started with my most current and representative work. 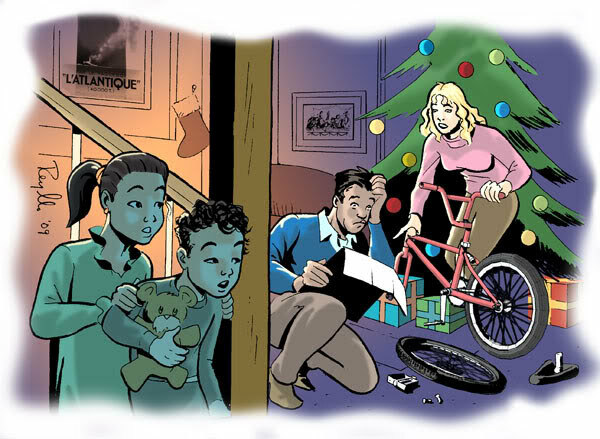 ("The Care Package," released in March 1991 in a one-off Rob Hanes comic-book, was the first RH story to officially see print. The story was later included in the Rob Hanes Archives trade paperback.) By the time I exhausted those stories and began going back to release my older work, I realized my first three stories were too crude compared to my current work, so they were shelved. As the series jelled, these early stories also fell out of continuity. For all these reasons, these three stories were not included in the above-mentioned Rob Hanes Archives trade paperback which collected the other early stories in the series that had appeared primarily in zine format but not in the regular comic-book series. Nevertheless, "Koman!" was a real turning point for me. The earlier two stories—"Meet Rob Hanes" and "Loyalties"—introduced Rob as a new detective and the "odd man out" at Justice International, and provided the impetus for sending Rob overseas. 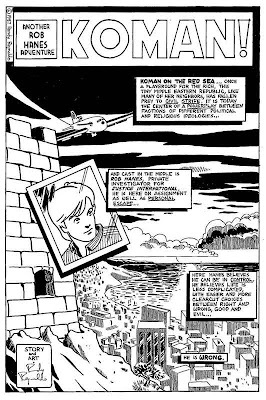 Anyone familiar with the series will recognize that "Koman," a fictional Middle East country, is the locale for many other stories, including, "A Night on the Town," "The Two Lady Agathas," "The Assassin," "Masks," "The Care Package," and, more recently, in RHA #9, "Rescue in Koman." But it all started in "Koman!" While Koman was not modeled on any one country, it included elements of places known at the time for instability like Lebanon and Yemen; and thanks to the continued volatility of the region, it shares many of the qualities associated with current hotspots like Afghanistan and Iraq. The common thread in the recent histories of these countries, which I tried to capture in the Koman stories, was the fracture among competing and warring factions along political, ethnic, and religious lines. Since it was the early '80s, Koman was originally envisioned as a Cold War battleground, caught between the U.S./Western bloc and Soviet spheres of influence—with the U.S. backing a weak central government that controlled the more developed, metropolitan and westernized part of the country and the Soviets exploiting a "rebel" force made up of religious fundamentalists and disenfranchised ethnic groups and tribes that controlled the outlying areas. Of course, with the end of the Cold War and the rise of fundamentalism, the Cold War piece has fallen away but the other factional splits remain in place. These are personalized in later stories by the figure of General Amra, a military strongman whom the U.S. supports, and Sayed Farsi, a moderate who leads a fragile coalition of rebel forces (both make cameos in "Rescue in Koman" in RHA #9). But given the volatility and rapidly-changing nature of the region, I decided to create a fictional locale for these stories. 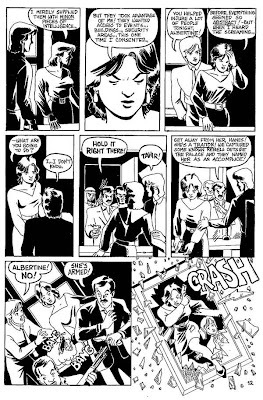 For the same reason Milton Caniff set his seminal adventure strip, Terry and the Pirates, in Asia because he saw the orient as "the last outpost of adventure" in the world, I saw the Middle East as having the same kind of potential for a wide range of adventure stories. 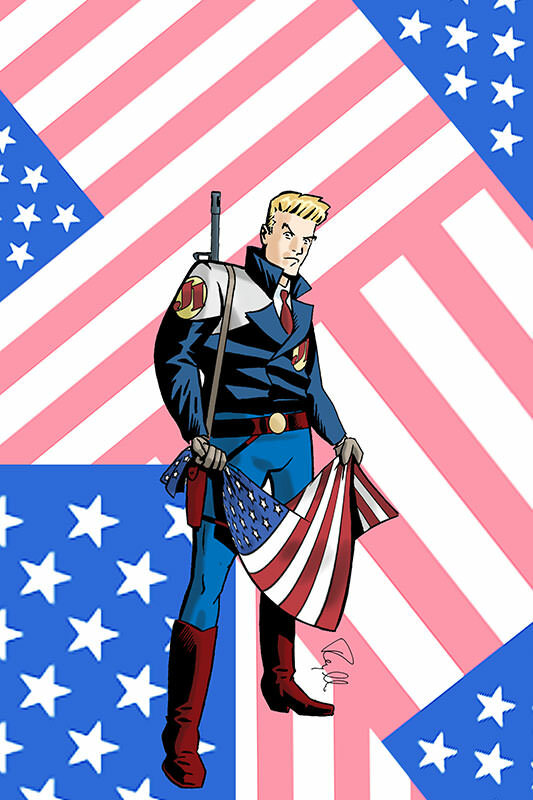 My goal has always been to eventually play out the Koman story arc in an adventure in which the country collapses and in which Rob might even be called to testify before Congress. This story is still in the cards, but I haven't yet felt the time is right yet for it. But "Koman!" is also a turning point because it was a story in which I felt some real progress both as a writer and an artist—while it's still rough around the edges, I could take some satisfaction in knowing that I was improving. If you take a look at the Rob Hanes Archives trade paperback, which collects the eight stories produced immediately after "Koman!," one can definitely see the steady evolution and growth in the series, and particularly the art.